Jared Unzipped: My Top Six Favorite Generation I Pokémon. Trying to choose my favorite Pokémon is like picking a favorite child; it just isn't possible. There are so many great options, so choosing one is extremely difficult. I have played the Pokémon series of games since the very beginning. My first cartridge was Pokémon Blue for the Nintendo Game Boy. Since then, I've come to appreciate nearly each and every Pokémon in its own way. But, I can narrow my favorite selections down by generation. Therefore, I present my top six favorite Pokémon from Generation I. 6. 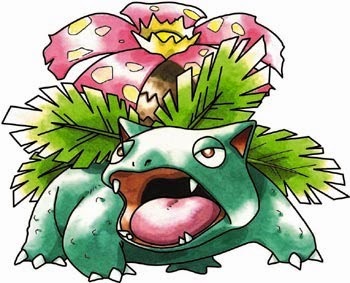 Venusaur - As the final evolved form of Bulbasaur, Venusaur is a titanic dinosaur-like beast that can pack a wallop. It is Grass / Poison type, giving it a wide access to many great moves like Petal Blizzard and Solar Beam. Given it's high defense, it's great for taking a series of blows and still staying in the battle. Thanks to the newly discovered Venusaurite, it can now Mega Evolve into Mega Venusaur! 5. 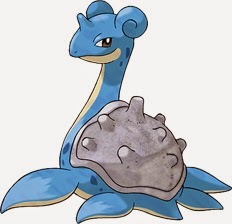 Lapras - Of the six Pokémon on this list, Lapras is the one I'd call the workhorse. It has an extremely high base hit points stat, meaning it takes a beating and keeps on going. Lapras' available move pool is also fairly large, meaning you can customize it to do pretty much whatever you want attack-wise. I like to take advantage of its Water / Ice typing and employ moves such as Surf, Ice Beam and Blizzard. 4. 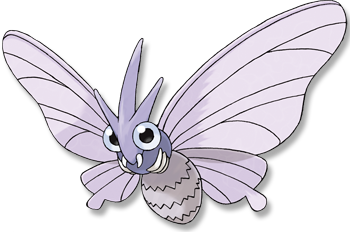 Venomoth - A deceptively effective Bug / Poison type, Venomoth is more of a threat that it appears. Though not a powerhouse by any means, it has high special attack and speed stats. I reap great success by using the Toxic / Venoshock move pair with Venomoth. First I severely poison the opponent with Toxic, then slam them with a powerful Venoshock, with usually lands the KO. If Poison is your favorite type (as it is with me), then you can't go wrong with Venomoth! As the icing on the cake, it's a purple moth -- YES on both accounts! 3. 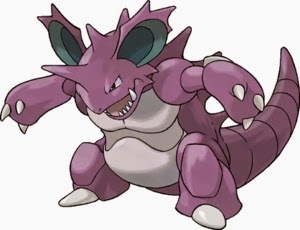 Nidoking - As a Poison / Ground type, Nidoking is an absolutely lethal monstrosity. It evolves from Nidorino with a rare Moon Stone. Having access to some amazing moves makes it a force to be reckoned with -- Earthquake, Earth Power and Sludge Wave to name a few. Its base states are impressive as well. Nidoking is probably the coolest looking Pokémon on this list. It's a giant purple monster -- right up my alley! 2. Pidgeot - Don't let its looks fool you. 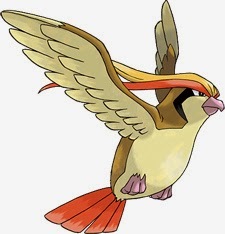 Pidgeot is very dependable, versatile and able to fight extremely well. Thought it may only be a simple Normal / Flying type bird, it is very equally balanced in the stats department. There have been many occasions in the past where Pidgeot has pulled me unexpectedly through a battle. As of the latest generation of Pokémon games, it can Mega Evolve into Mega Pidgeot with the Pidgeotite stone. 1. 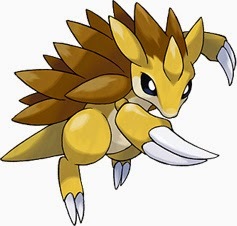 Sandslash - Probably my first choice among all the 151 Generation I Pokémon, Sandslash helped me finish the first series of games way back in the day. It grew to become my sidekick of sorts. As a Ground type, it's quite versatile and can defend against most other types. Poison, Rock and especially Electric don't stand a chance against it. Though, it is weak against Flying, Grass and Ice types. Thankfully, it has access to plenty of moves that allow it to combat against them. Plus, it's covered in spikes and scales. Awesome! I feel I am much older than you as I do not understand Pokemon AT ALL!